Ever notice that the stronger (more broadband) your internet connectivity has the more data can be shared and the faster it moves through the internet matrix? As I am no computer whiz often I would try to send too much data, picture files in particular, to someone and the computer would bog down and nothing would go through. It felt like the computer was trying to go through peanut butter or mud. It took me rather a long time to actually understand how to limit the data I would try to send to a reasonable amount that could be handled by the particular computer I was using. Too much info at once and everything stopped. The correlation between this aspect of the internet and training/handling horses is obvious I think. Too much input, too quickly, shuts it all down. 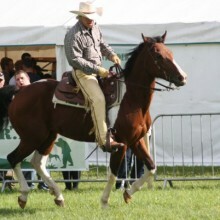 With horses, this creates fear as information sent between horses is always clear, precise and contains just the correct amount to be received easily and quickly by the other horses. Too much information, energy, or whatever, provided too fast confuses horses and, when they are confused they become afraid. When they are afraid they cannot easily comply with requests made. 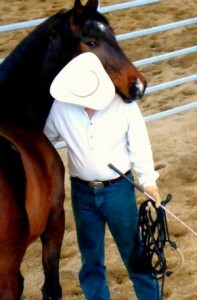 Resistance is shown and the horse is often judged as being naughty or bad. We don’t judge a computer as being bad when it gets bogged down with too much info trying to be sent in a file or email. We easily understand it is just a machine and, in that sense, is totally innocent. We then take responsibility and steps to remedy the situation by spreading the files out into smaller more easily handled bits of information. This frees the computer from being overloaded and it can to begin to function well again. Unfortunately, this is not always what happens when we overload (over input) a horse and it becomes resistant to cooperation (afraid). We get angry at it, judge it as being disobedient and add more energy by shouting at it, punishing it, reprimanding it and trying to force compliance. I have seen this so many times it is ridicules. Certainly some unwanted behaviors require a consequence and even a reprimand be provided. But my belief is that the majority of unwanted behavior from a horse is symptomatic of fear and should be understood as such. Therefore, first compassion should be offered and then steps taken to understand the source of the fear. Those steps can include additional training, desensitizing and more. Once the motivation for the fear is known, perhaps the correct approach to turn the fear back to trust can be discovered and applied.